Prague Square Hostel i Praha, Tsjekkia: Bestill nå! Oversatt av Hostel gjester har sagt 'plasseringen ikke kunne være noe bedre "på Prague Square Hostel. Det er satt ved siden av Gamlebytorget og den astronomiske klokken i gamlebyen. Dette vandrerhjemmet er et godt alternativ for de på et budsjett som den sentrale beliggenheten sørger for at gjestene har lite behov for trikk eller taxi for å komme seg rundt i byen. Våre besøkende har sagt de ansatte er "svært vennlige og hjelpsomme med alle spørsmål, [de tar] tid til å påpeke ting på kartet og [gjør] en gratis frokost og smørbrød hver dag". We are located directly in the HISTORICAL CENTER of Prague. JUST 150 STEPS from the famous Old Town Square (Staromestske namesti) with famouse Astronomical clock and 1 min walk from Wenceslaw Sq. The area of bars, clubs, shops and historical sights. No tram, metro or taxi needed!! THERE IS NOT MANY HOSTELS so centraly located in Prague! Our great location SAVE YOU MONEY which you would spend for public transport and taxi if staying out of Prague historical center!!! Hostel is just newly reconstructed with 24hours reception, no lockout!! Club and bar in the courtyard! 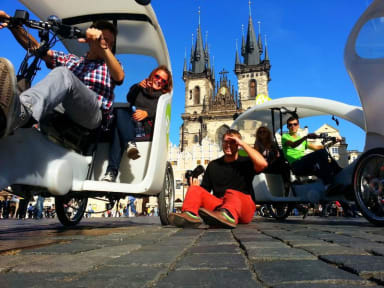 We provide all the info about Prague, tickets, city walks. ARE WE FULLY BOOKED OR YOU DID NOT FIND CONVENIENT ROOM TYPE? Then check out our other hostel OLD PRAGUE HOSTEL!!! Stayed one night, but it was exactly what I needed. Right in the center and easy to find. service was awesome: Marq checked me in- big plus that you can check in late and all, and he was the nicest ever! Friendly and so helpful- you are epic! Only downside to this place is that the 10 share room barely has room between the beds. But hey its not the end of the world and you do get a own locker which fits big bags! Oversatt av Dette er et veldig kulturelt og historisk rikt område, og en av våre mest unike aspektene er at vi er i en historisk bygning med de gamle Praha legender på veggene.